The resurfacer consists of a sled which supports one or more propane bottles. 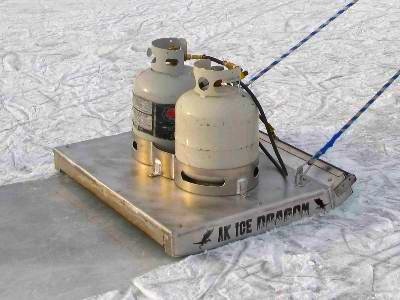 The flame produced by a series of propane jets travels the length of the sled in contact with the ice and is exhausted at the other end. The resurfacer can be made any width as long as there is a sufficient number of jets. The wider the sled, the fewer passes required to resurface a given area. The prototype at left is 3 feet wide and 2 feet long and can be easily carried by one person and placed in the back of a car or truck. We will be building the resurfacers so a person can gang two or more of them together side-by-side. This will make it possible for customers to resurface a wider stripe of ice with a single pass.